Long weekend away from the city didn’t happen? No time to take a holiday? No sweat. What’s stopping you from looking at our own city through the lens of a tourist on a day off. Though we may not have a Qutub Minar or a Taj Mahal in the hood, Bangalore does its bit with drama, food, dance, music, football and palaces. What more could you possibly want? So make the most of the holiday today and discover Bangalore through our eyes. While we’re not considered the hub for theatre in the country, we sure can be boastful about the quality of our plays. Be it a traditional Yakshagana (folk theatre combining dance, music and dialogue) or Hamlet by The Globe Theatre on its worldwide tour, there is something for every kind of culture vulture. The main centres where you can watch a play (or other forms of art and culture too) are Alliance Francaise de Bangalore, Chowdiah Memorial Hall, Rangasthala Auditorium at Rangoli Art Centre and the two hard-core theatres, Jagriti and Ranga Shankara. Central Park might be a bit idealistic but good old Cubbon Park and Lalbagh will do the trick if it’s a stroll under Gulmohar and Jacaranda canopies you’re looking for. Take a picnic with you to either of these large parks, both of which have jogging paths for the fitness inclined. A word of caution though: make sure you’re not sauntering alone post sunset; it could get a bit intimidating. Both parks have interesting species of flora and fauna so set aside time to go to the glasshouses for an in-depth analysis of trees and flowers. Or just look out for the labels of the barks of them for names and age. Check out more here. Wake up early and head to Malleswaram or Basavanagudi, both old town hoods which serve up the most authentic brekkie. There you will be spoiled for choice when it comes to this traditional Bangalore breakfast – benne dosa. CTR and Veena Stores are our go to places in Malleswaram and the other side of town sees Mavalli Tiffin Room (MTR) and Vidhyarthi Bhavan as hot favourites. Follow it up with a coffee at Brahmin’s Coffee Bar. Our very own High Street, if you will, you’ll find everything from elastic for your pajamas and Usain Bolt’s latest launch of shoes at Puma for the next marathon. And while the branded shops are a necessity these days, the charm of ‘Comm Street’ is in its hawker-style sale of bangles, shoes, socks, hair accessories, knick-knacks, and perhaps over-priced cotton candy and popcorn too! Dive into every left and right turn you pass, as like Harry Potter’s Diagon Alley, each has something different to offer – be it foreign (cough: smuggled) swimwear, shoes or bindis in all soap-opera styles one can imagine. You can even make yourself a ‘Fancy Blouse’ in under 60 minutes! Check out our guide to shopping at Commercial Street here and here. We’re landlocked and we have no mountains, but what the city does have is significantly more lung space, and you’ll get to ‘the hill’ before you can even reach the airport. Make a half-day of it by setting out early in the morning to watch the sunrise. Or better still, set out at about 3 in the afternoon, hire a cycle and ride up the hill from the base. Or trek up it, taking short (tough) cuts and stop for photo-ops on precariously balanced rock formations all the way to the top. The religiously inclined can even pop into the myriad little temples and the main Bhoga Nandeeshwara Temple, dedicated to Lord Shiva. There is also Tipu’s Drop where the warrior is said to have tipped prisoners over to their death. On a more positive note, there’s a palace and even a spot to take off for paragliding. Then, watch the sun go down and the city transform into a light show. As if you haven’t been spoiled for choice already, this is the ultimate street to soak up some local flavours. At VV Puram, an entire road transforms into an evening food bazaar where you can watch rotis being flung like Frisbees before being roasted, or how bhajjis are so sinfully fried to perfection. Predominantly a South Indian affair, there is a presence of the North in the form of chaat, rolls and even some typically greasy Indian Chinese. Savoury snacks like Kodu Bale (fried rings of dough) and Bondas are on offer, while Jalebi and Dal Holige (sweet paranthas) hit the spot for those with a sweet tooth. Be it the replica of the Windsor Castle in the middle of Palace Ground which belongs to the Mysore scion, or the beautiful Jayamahal Palace of the erstwhile princely state of Gondal, you can get your share of royalty at these two palaces. The Mysore one is a museum by day and serves as a backdrop for weddings at night; so make sure you get your pictures in the daytime. The Jayamahal Palace too is a wedding hotspot but being a heritage hotel, you can live and dine like a king here, for that extra indulgence. 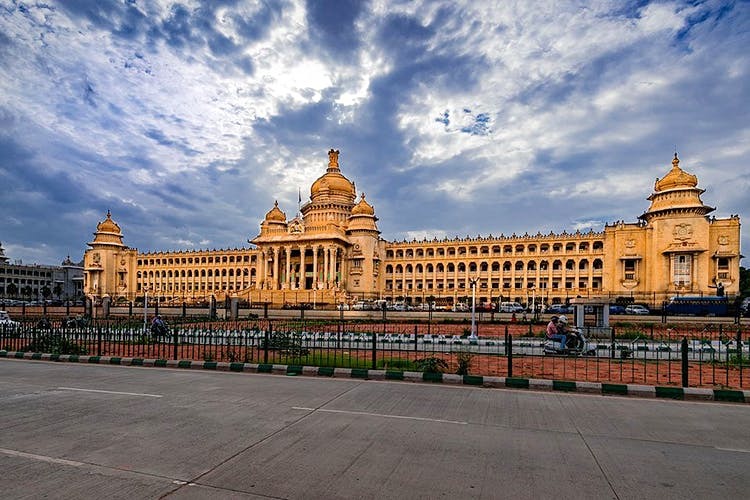 You can also check out our gorgeous Vidhana Soudha which is every bit a palace! The city of beer, pubs and music gigs, finish the night at one of the countless live-act spots in town. As varied as folk, contemporary, EDM and of course, rock, the city is filled with places where you can catch a musical performance. Our top favourites are The Humming Tree, blueFrog, Hard Rock Cafe and bFlat. If you're in Bangalore, then you have to make sure you're here on game night, when the mighty home team, and multiple time champions, Bengaluru FC is playing at Kanteerava Stadium. You'll see all fans making their way from across the town to their sacred and solid Fortress (what fans call their home stadium). Buy tickets for West Block A, for the best atmosphere. Other stands are picking up in fervour and you cannot deny the frenzy of the West Block Blue, the whole bunch of home team fans. Chants encouraging the one and only Captain, Leader, Legend, Sunil Chhetri can be heard over anything else, as well as BEE EFF CEE, BEE EFF CEE. Sometimes you'll hear jibes too, but that is what you're here for! Go on, like a True Blue would say #FloodTheFortress. Drink Beer. Craft Or Tap. Bangalore’s drink of choice is, undoubtedly, the beer. For those of you who’d like to go old school, India’s pub capital offers a delightful array of beer pubs where you can tank up on pitcher after pitcher without causing a dent to your pocket. Beer lovers can also pick from the city’s burgeoning list of craft breweries that includes the likes of Toit and Arbor Brewing Company.